Saving money with a plan always adds up. Today it's Orlando Dollars. Here’s a tradition worth continuing – Orlando Dollars. Marcela and her son Tristan have never been to Disney World. That fact that was known to her partner Jason, who has been there many times. It’s a situation they want to rectify, and here’s how they are going about it. First, Marcela is careful with her money. Her work with Canada’s Money Coach has taught her a new appreciation of cash. She knows to allocate her money, anticipate her expenses and save with a goal in mind. There’s always a plan. Following advice from Canada’s Money Coach, Marcela takes a budgeted amount of cash out of her bank monthly, that’s what she has to spend, no more, no less. It goes towards her bills as well as covering her daily coffees and other incidentals. When there is money left over at the end of the month – yes it does happen – she puts it into a jar for special events. This time the special event is spelled D I S N E Y. And here is where it gets interesting. It’s a family effort. Ten-year-old Tristan is helping make this dream come true and learning some valuable lessons about saving and spending money. Today, Tristan has a list of chores for around the house, things like putting his laundry away and helping out in the kitchen and with the dogs. 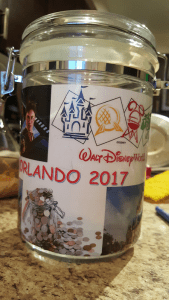 When he completes his work in a timely manner or pitches in with something not on his regular list, he is rewarded with ‘Orlando Dollars’ that are put into the Orlando Jar towards the dream trip. Marcela has decorated the Orlando Jar and it is on display in her kitchen. It’s a daily visual reminder of their goal and the reward for sticking to a plan. Now rather than looking at chores as work, Tristan see’s what’s at the end of the plan. A trip to Disney this autumn. He’s counting down the days, while the money is adding up. Finally, this is a real-life example of how working with a Money Coach can help you plan for big events while living comfortably. No penny-pinching. Marcela and Jason are teaching Tristan about the value of money, the importance of planning and saving towards a goal. Have a goal in mind you want to achieve? Get in touch with me today, Canada’s Money Coach will help you add up to success. 613-875-5834.